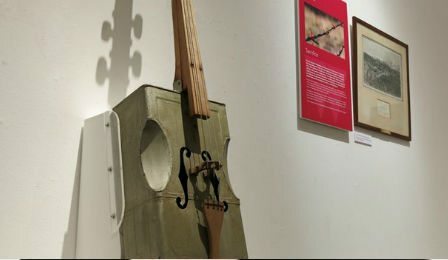 A unique World War 1 ‘trench cello’, ingeniously sculptured from an oil can, has been unveiled at the Worcester City Art Gallery and Museum, in England. The instrument, constructed by Royal Engineer solider Reginald Quelch during the 1st war, will serve as a centerpiece for the museum’s ‘World War One in the Words of the Worcestershire People’ exhibition – set to run until March 14th. “The trench cello is such an evocative object from the museum collection. You can see the inventiveness of the maker in the beautiful hand-turning of the neck and shaping of the oil can to create a real musical instrument. It’s easy to imagine it bringing a little cheer in the most tragic circumstances,” Senior curator Philippa Tinsley has said. A similar trench creation was emotively played last November, by virtuoso Steven Isserlis during the Armistice Day Parliamentary Service of Remembrance, at Westminster Abbey.